Huawei, the Chinese telecoms giant, is launching a marketing campaign with the tagline 'Test Pilots Wanted' in a bid to highlight the speed of its 4G mobile products. The creative, which was designed by Let Us Create, features a series of headshots of people whose faces have been distorted by the '4G g-force' as they hold a Huawei 4G device in their hands. The campaign will call for test pilots to "strap in" and "prepare to be blown away" by the speed of the new Huawei Ascend P1 LTE, which uses 4G connectivity and has a 1.5GHz dual core processor. M2M bought and planned the campaign, which will kick off tomorrow (16 November) with print, online, social media, out-of-home and experiential activity. It is understood that M2M beat MPG to the media-planning and buying brief. Both networks were appointed as preferred partners for media-planning and buying projects following a pitch earlier this year. The campaign follows Huawei's 'Beauty And Brains' activity for the original Ascend P1 handset in September, which was the brand's first significant marketing activity in the UK, since Marketing revealed its intent to develop a consumer proposition. Jill Styring, UK and Ireland marketing director for devices at Huawei, said: "The ‘'Test Pilots Wanted' campaign delivers the focus and cut-through that new brands in hugely established and competitive markets require. "The introduction of 4G technology in the UK delivers a lightning injection of pace into UK airwaves. It is hugely exciting to be a part of this era-defining moment. 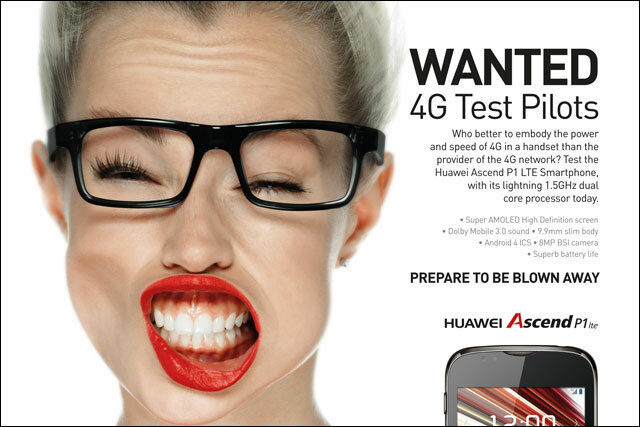 For speed and performance, Huawei's 4G devices will blow people away. This campaign perfectly captures that." Huawei has stepped up its marketing over the last 12 months in a bid to break into the competitive UK mobile market and the brand appointed Bartle Bogle Hegarty to the global ad account for its devices business division in February. BBH was charged with developing an integrated campaign to launch two new Huawei smartphone products and to develop a brand platform. In July, Huawei signed a partnership with sports broadcaster and Olympic rights holder Eurosport to promote the Ascend P1 through ads during Eurosport's event TV over the summer. In the UK, Huawei is run by executive vice-president Mark Mitchinson, the former head of rival manufacturer Samsung Electronics in the UK and Ireland. What do consumers think of 4G?